The First Intifada was a popular uprising in the OccupiedPalestinianTerritories that shattered complacency and forced Palestinians and Israelis to reexamine the political, social and geographic status quo that had been ossifying since 1967. Although it failed to secure Palestinian freedom or produce lasting Middle East peace, the First Intifada left an indelible mark on the region, brought the two sides to the negotiating table for the first time and featured women in key leadership roles, which expanded the scope and reach of the uprising. For much of the world, however, the First Intifada is still remembered as a violent eruption. Very few Israelis or Americans point to civil disobedience as being a significant component of the uprising, although Palestinians adopted many nonviolent strategies to challenge the occupation and assert their rights on a mass scale. While the iconic image of the First Intifada is a masked teenager hurling stones at Israeli soldiers, in reality the backbone of the uprising was made up of vegetable growers, student organizers, union members, home-based entrepreneurs and volunteer nurses. Over twenty-five years later, lessons from this era are still relevant to freedom seekers in the Middle East and beyond. We sought to examine the beginning of the First Intifada – when the civil disobedience movement that was the driving force behind the uprising was at its peak – with the aim of creating an engaging and thought-provoking film/media project to share lessons learned from this period with the next generation of grassroots leaders. Through targeted interviews, we are exploring the strategies and tactics adopted by Palestinians during the First Intifada, with particular emphasis on women’s leadership in nonviolent movement-building and an analysis of what lessons could be relevant to activists today. Following rigorous and systematic research, which included a comprehensive literature review and an assessment of more than 600 hours of archival news footage, we embarked on the interview stage of the research project. Given the sensitivities around past and current political activities, we are dedicating significant time towards cultivating relationships with key figures across the OccupiedPalestinianTerritories in order to build trust, gain their confidence, research their histories and hear their stories. With the support of the International Peace Research Association Foundation, we completed five semi-structured interviews with women leaders from the era. Just as the First Intifada was a moment when women from all sectors and backgrounds participated in nonviolent movement-building, we wish to ensure that a multiplicity of voices are captured and the full picture of challenges, obstacles, successes and lessons learned are relayed to the next generation of grassroots leaders. Our interviewees offer a snapshot of the many roles, experiences, geographic and socioeconomic backgrounds that characterized those who were active during the uprising. They represent different political parties, class statuses and a geographic spread. These interviews explored the participants’ experiences during the first 18 months of the First Intifada. We asked about their childhood memories and upbringing, examining how each woman became active in local demonstrations, who had inspired them and which role models catalyzed their participation. Their remarkable stories surface inspiring themes of volunteerism, community, motherhood and a deep sense of purpose that united Palestinians in a shared struggle for their rights and freedoms. The central part women played in leading and sustaining the infrastructure of the First Intifada speaks not only to how critical their involvement was during that time, but also how important their contributions continue to be today. After the First Intifada, the women we interviewed went on to serve as professors, political leaders and to head NGOs focused on women’s rights. In their interviews, they lamented that women’s acheivements and contributions were largely forgotten after the Oslo Accords and expressed hope for greater participation today. With our research project, we seek to share these unknown stories at a critical moment when role models are urgently needed. The interviews we are capturing on film offer a powerful way to illuminate how deeply involved women were during the uprising, draw greater attention to the fundamental role they played in a pivotal period in Palestinian history and to provide role models for current and future efforts. Julia Bacha has been awarded an IPRA Foundation Peace Research Grant for a project she’s pursuing with her colleagues at the Washington, D.C. non-profit Just Vision. Julia Bacha is a Peabody award-winning filmmaker, media strategist, and the Creative Director at Just Vision. 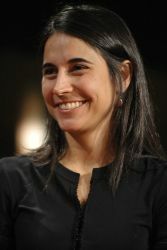 Julia started her filmmaking career in Cairo, where she wrote and edited Control Room (2004), for which she was nominated to the Writer’s Guild of America Award. Subsequently, she moved to Jerusalem where she co-directed Encounter Point (2006), and directed and produced Budrus (2009) and My Neighbourhood (2012). Her work has been exhibited at the Sundance, Berlin and Tribeca Film Festivals, broadcast on the BBC, HBO and Al Jazeera, and profiled in The New York Times, The Washington Post, The Times and The Economist. In addition to over thirty film festival awards, Julia is the recipient of the King Hussein Leadership Prize, the Ridenhour Prize and the PUMA Creative Impact Award. She’s a Term Member at the Council on Foreign Relations, a Young Global Leader at the World Economic Forum, and a TED speaker. Just Vision highlights the power and potential of Palestinians and Israelis working to end the occupation and build a future of freedom, dignity, equality and human security for all using nonviolent means. We tell their under-documented stories through our award-winning films, multimedia tools and targeted public education campaigns that undermine stereotypes, inspire commitment and galvanize action. Our overarching goal is to contribute to fostering peace and an end to the occupation by rendering Palestinian and Israeli grassroots leaders more visible, valued and effective in their efforts.